Lama Chokden. Sogyal Rinpoche once said "If you need a picture of someone sitting, use this one". 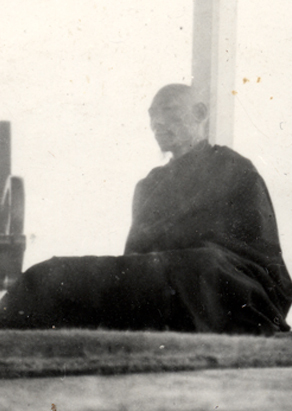 My master’s closest assistant and master of ceremonies, Lama Chokden, had been with my master longer than anyone. He was a silent, serious, ascetic man with piercing eyes and sunken cheeks, and a dignified and elegant but humble manner. Chokden was known for his fundamental integrity, his deep, human decency, his courtesy of heart, and his extraordinary memory: He seemed to remember every word my master said, and every story, and he knew the smallest details of all the most intricate rituals and their significance. He was also an exemplary practitioner and a teacher in his own right. This page was last edited on 18 September 2018, at 19:42.